The projects shown here are not products or solutions but they are ideas which others might find useful to develop their own gear. Now have got around to anodising the Mega Beamer bits & pieces. 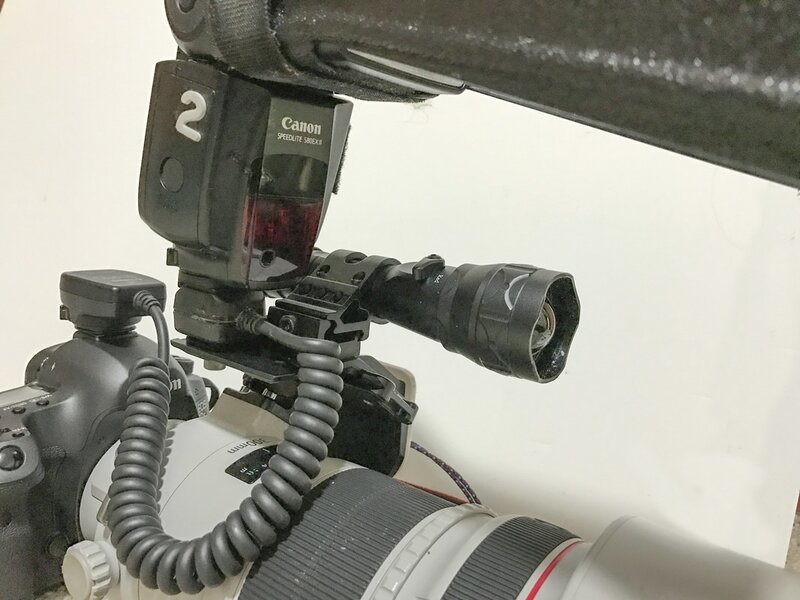 Also replaced the filtered LED light with a WolfEyes X beam red LED light & added a red LED array within the fresnel housing to give a low level night-light that is too soft for focusing. The 12V battery pack is vecroed to the Lidar column. Generally I use fixed focus but the WolfEyes is there in case. 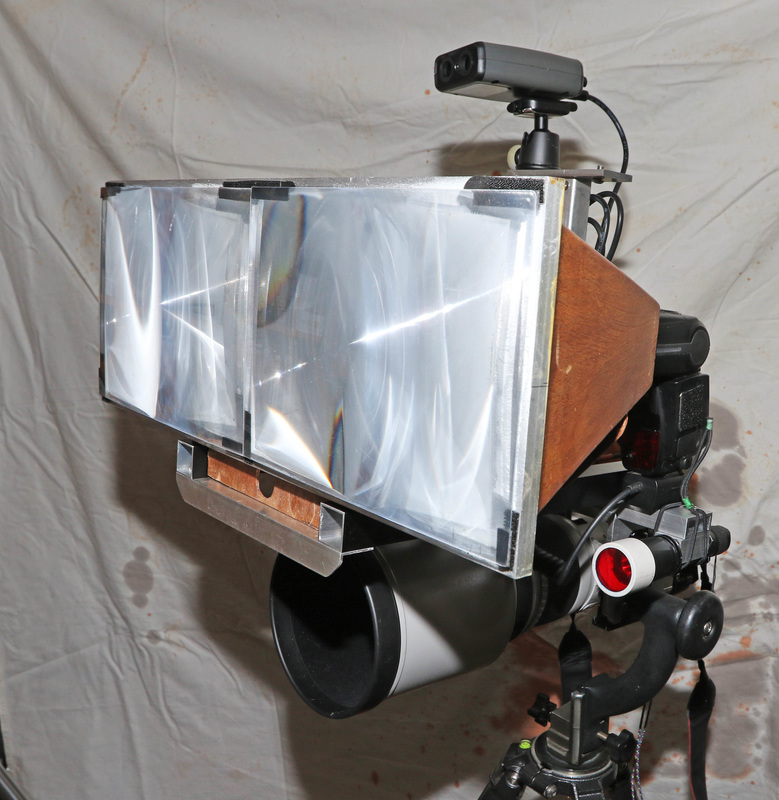 ​Some time ago I saw a mention of using large Fresnel lenses for a bigger Better Beamer with claims of much increased flash output. When A4 fresnel lenses came up on eBay for a few bucks I thought I would have a play. Several months later here is the result: the MEGA BEAMER. Testing has shown that I have found only another ‘stop’. 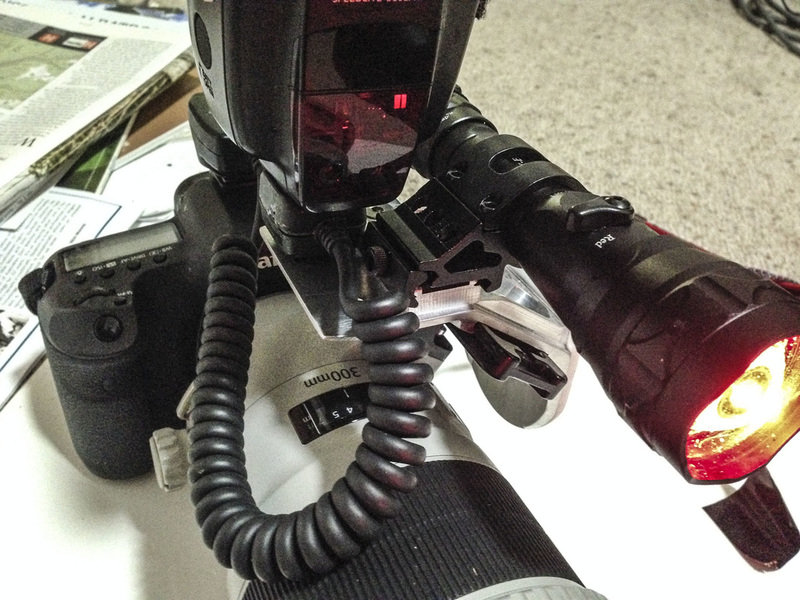 The increased light comes from the narrower beam focus with flash zoom at 105mm but alignment is quite critical. However it is much quicker & more accurately set up in the dark as it is attached as an pre-aligned assembled unit with one ¼” UNC screw. 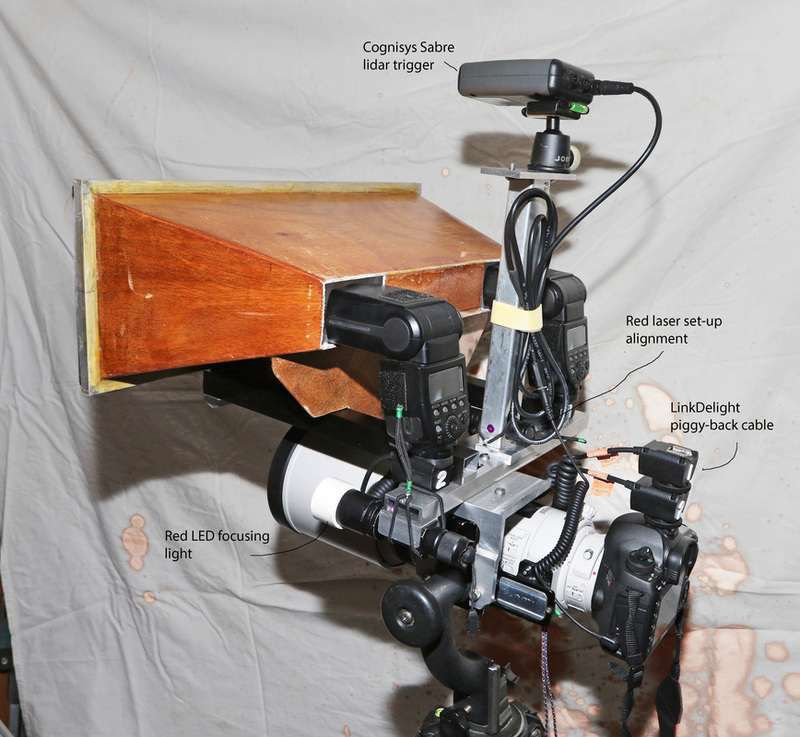 It is controlled with a Cognisys Sabre ‘lidar’ trigger. I will add a laser to the Sabre bracket to align the beam more accurately. Was the one ‘stop’ worth the trouble? No, but the manufacturing process was fun & it is surprising the little lessons you learn along the way, especially in the testing phase. For those that are worried, the light & laser are not used in the presence of owls. Should anyone else be thinking of having a play with fresnels, or 'lidar', I am happy to share info. 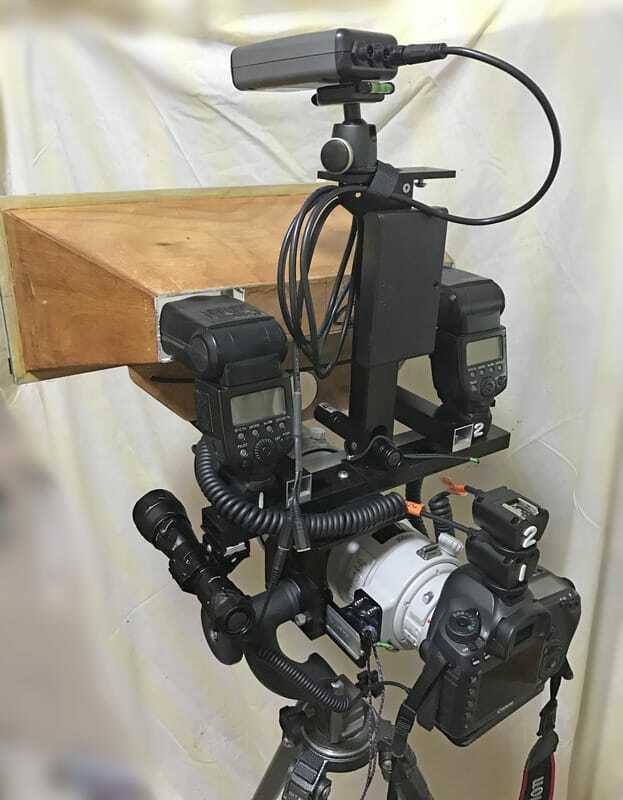 ​The setup in the hide looks like this. See the Gallery page for images taken here. For those concerned at the use of flash, following the opinion of Prof. Jack Pettigrew. 1. Bird Retinas Can Tolerate the Sun: All birds have retinas that are adapted to work in bright light, with 3 or 4 varieties of cones that permit colour vision better than our own. Perhaps surprisingly, this is true even for owls and other nocturnal birds, all of which have much better colour vision than nocturnal mammals. The sun produces a bright image on the retina that is orders of magnitude brighter than that produced by a spotlight. Birds can fixate the sun, putting that image directly on the retina, with relative impunity compared with mammals. 2. No Empirical Evidence for Worry: In my numerous field trips to study birds on the Diamantina (letter wing kites, plains wanderers, barn owls, inland dotterels), I never noticed any special problems using both 50W and 100W spotlights. Captured birds seemed OK after being exposed. Retinas of birds that were subjected to bright spotlights looked normal in those rare cases where the spotlight-captured bird provided histological material soon after exposure. 3. One Hour of Blindness: Retinal rods take 30-40 min to dark adapt (i.e. achieve their maximal sensitivity so they can detect single photons) after being exposed to bright light. This is true for both birds and mammals. A nocturnally-hunting bird would therefore be out of action in dim light for around 1 hour after being exposed to the spotlight. If that hour were crucial for survival, or if another team came later and compounded the problem, then spotlighting would have deleterious effects that night. [I tried to capture my letter-wings after they had finished hunting (a relatively easy task with this bird because it hunts with the moon) and this helped to minimise the impact of spotlighting on birds that were feeding young. The impact of being effectively blinded for an hour after being spotlighted would have to be judged carefully for each bird, based upon knowledge of their natural history and routines. Another indirect way that the blind period after spotlighting might compromise the subject is via an effect on susceptibility to predation. I would not be surprised to learn that predation risk was increased during this blind period. To keep this risk in perspective, however, note that the more important senses for evading predators are the mechanical senses, like vibration sensitivity, touch and hearing. These have much shorter reaction times than vision, which is sluggish to the extreme in dim light and may not be missed as much as one might think in the area of predator avoidance. Most current LED flashlights that use 18650 batteries are a standardised 25.4 mm (1 inch) diameter. There are numerous 1 inch brackets on eBay to suit various rifle rails, Picatinny, Weaver, etc. "Rifle Torch Mount" search should find them. 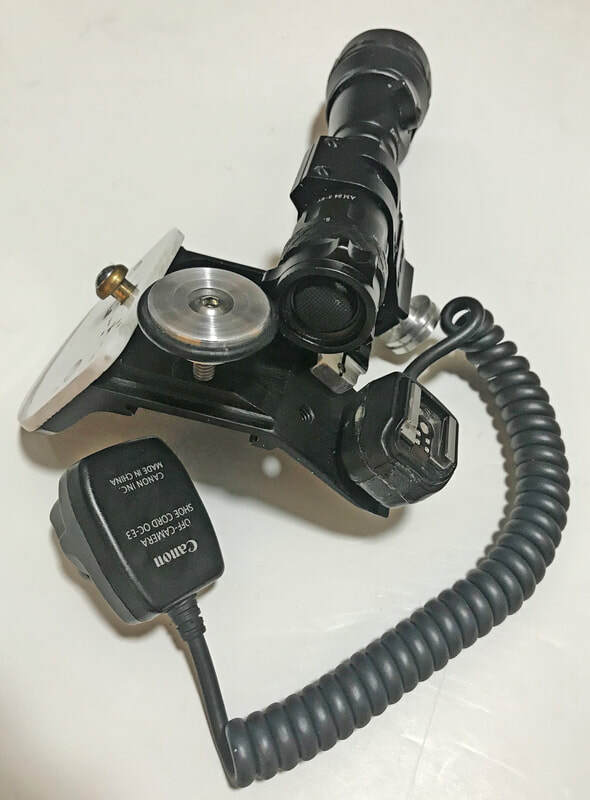 Some include flashlights at very low prices, but be aware that the cheap ones don't include circuitry that compensates for voltage drop & they grow dim very quickly. Same with 18650 batteries. The cheap ones advertised as 3000+ mAh have been shown to be closer to 300 mAh ! ​Here are a couple of implementations for wildlife photography. First 3 are WolfEyes mounting on a EF300. 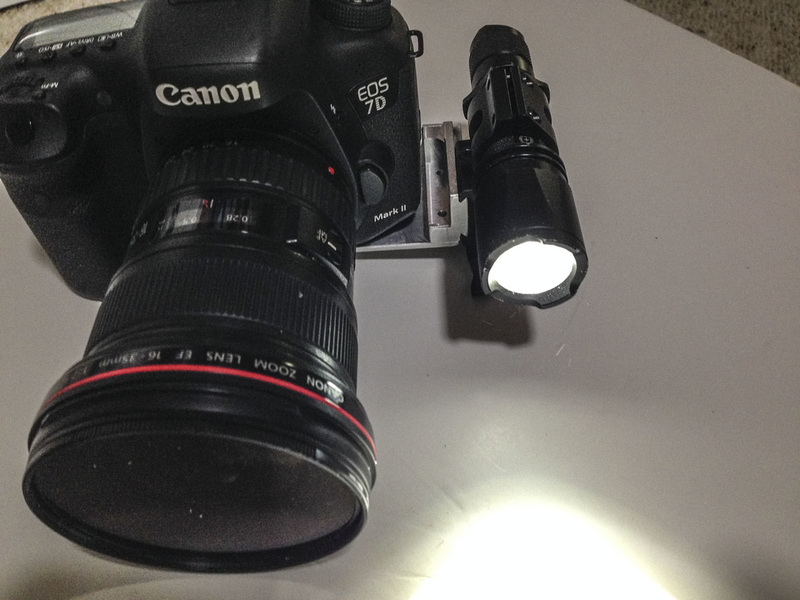 Fourth pic is of simple LED torch mounting for frog photography. Below is a home-made L bracket with short section of 16mm rail, offset scope clamp & Wolf Eyes X Beam. 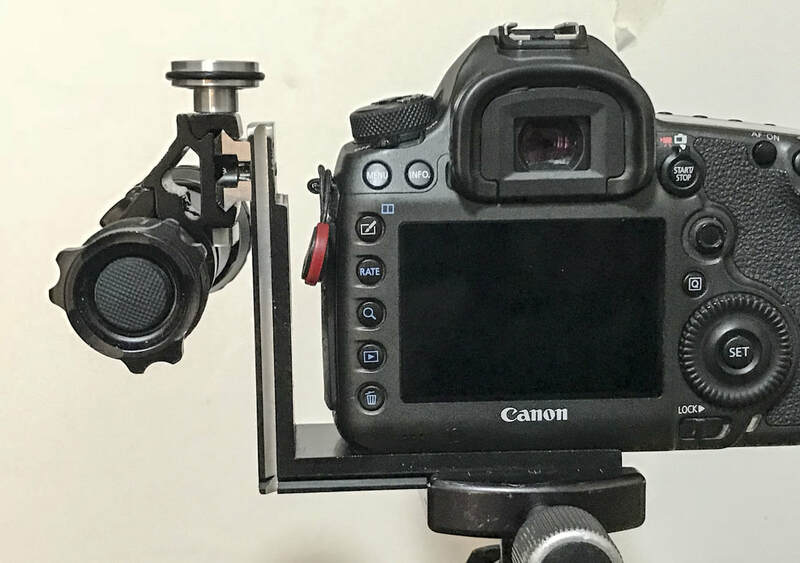 Below is similar except using a small Arca Swiss clamp. 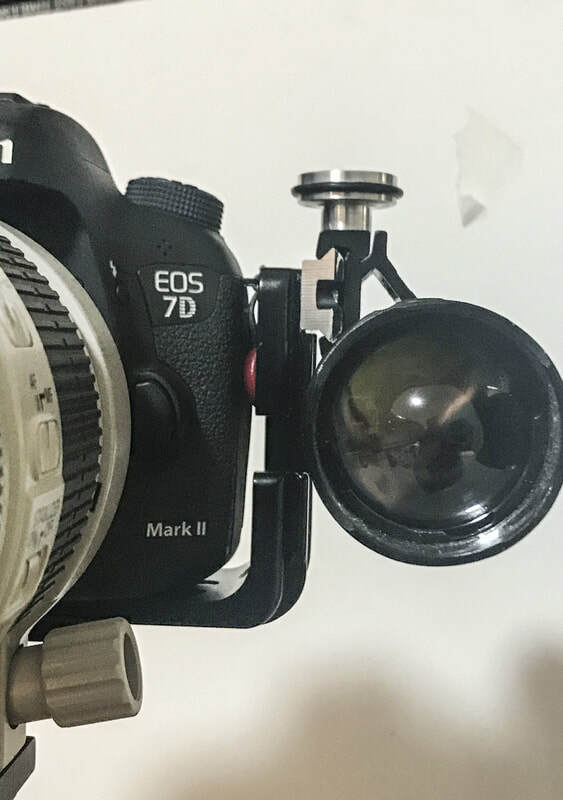 Below is a 7D II with a RRS L bracket modified with a 16 mm rail. 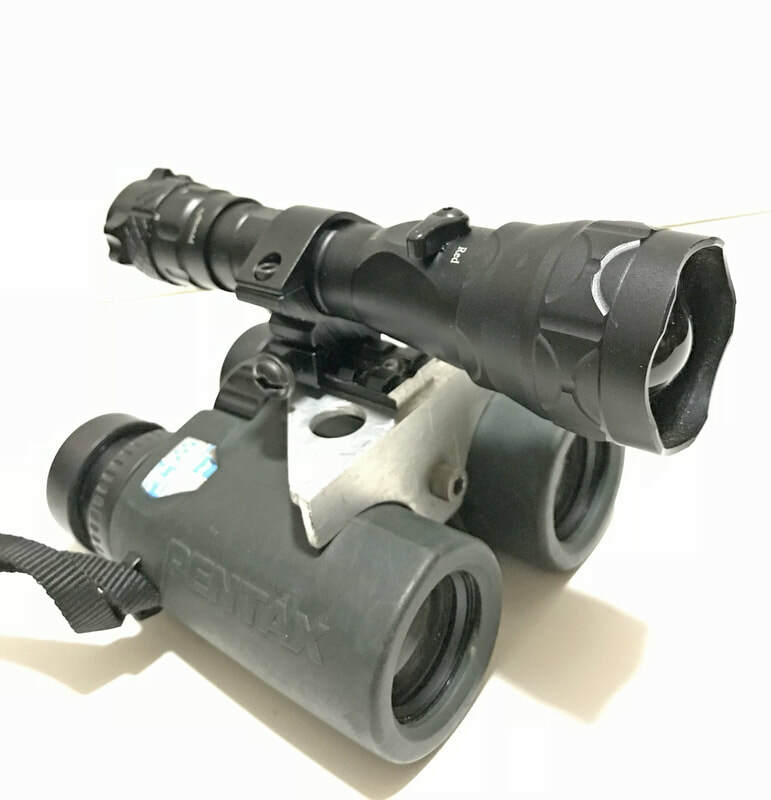 Below is WolfEyes X Beam fitted to Pentax binoculars for night work. 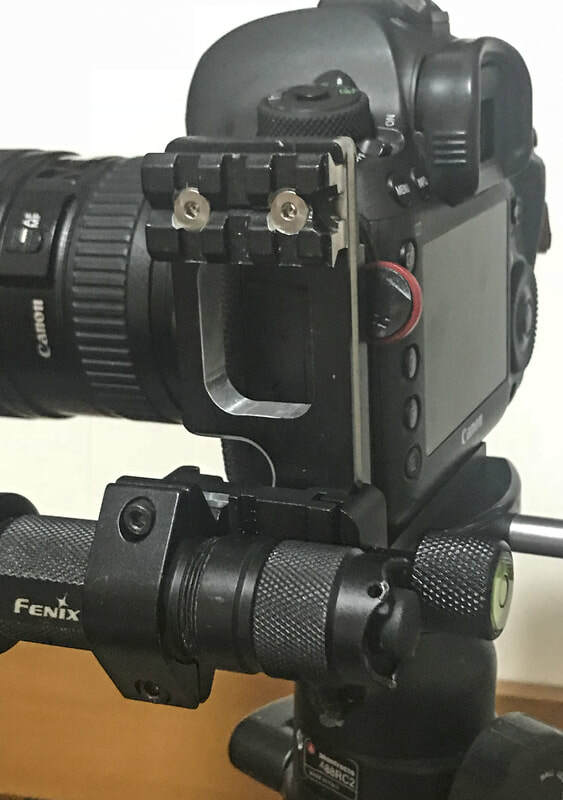 Uses 3mm Bunnings aluminium angle, 1/4" UNC screw, 1" Picatawny rail & scope bracket from eBay. 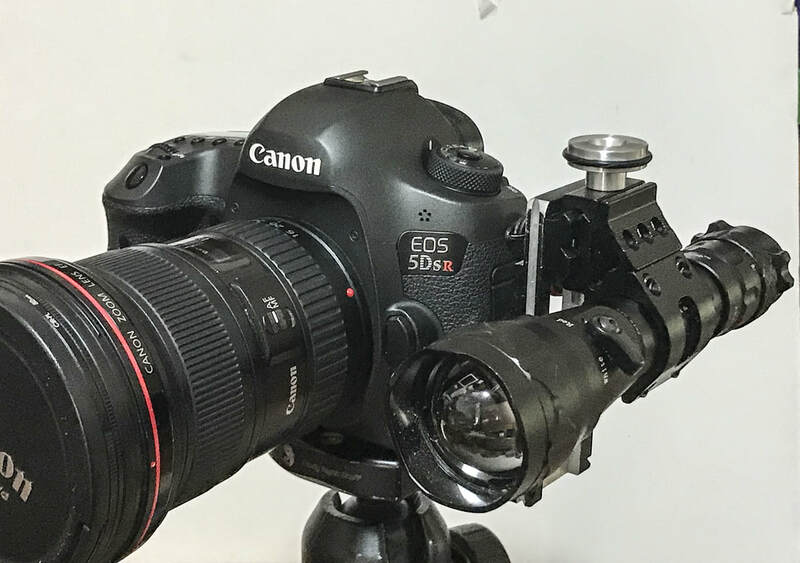 camera,monopod,tripod,slow shutter photography,wildlife photography,nature photography,telephoto,camera support,birding bird,digital photography,camera shake,shutter speed,Canon long-lens,100-400L IS,500F4L,EF300 2.8L,EOS 7D,EOS 5DsR,arca swiss,B&H,Naturescapes,Really Right Stuff,RRS,Wimberley,Manfroto,Gitzo,Kirk Enterprise, Benro, Silk, Velbon,DP Review,Birforum,Birding-aus,Birdlife,Birdline. 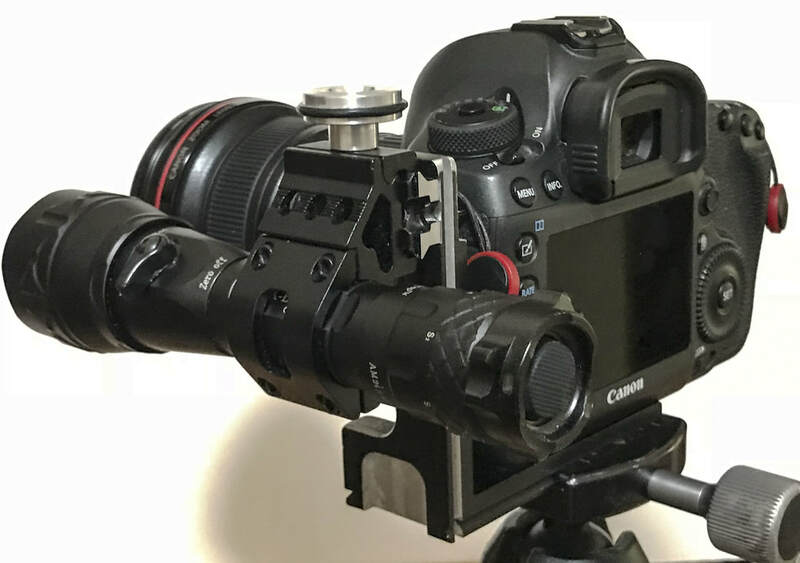 Cognisys, Mega Beamer, LinkDelight,Cognisys, EOS 5Ds II, EOS 5Ds Mk ii, EOS 5Ds Mk2.